Well, the comments were overwhelmingly in favor of my continuing Zeta. Now, I was going to make a Metroidvania either way, but if I could have found some art assets to help me I would have been willing to submit Zeta for the competition. But sadly, there was a dearth of platforming shoot-em-up graphics in the competition. You can see all the art assets submitted for the competition here. Warning, that link will take forever to load, not just because it’s every piece of art submitted, but because it’s every version of every piece of art submitted. Twice, for some reason. Also, believe me, some of the stuff on there is just plain weird. Now, some of the artists just went off and did their own thing. Some of the stuff doesn’t look like anything more than a concept sketch – and since we’re not allowed to alter anything in the programming portion, they’re nigh-unusable. But some of the artists had done this sort of thing before and provided very complete sets of graphics. For instance, if you’re looking to make a Roguelike, you’re covered. If you’re looking to make a top-down eight-way game (like the original Legend of Zelda), you’re covered. If you’re looking to make a Mario-style platformer where the character just runs and jumps (and perhaps has a short melee attack), you’re covered. Notice that the top and bottom halves of her body are split so that she can run in one direction while firing in any other direction. Also notice that she can…apparently turn into a red-eyed cyclops for some reason. Good, good stuff. But no. 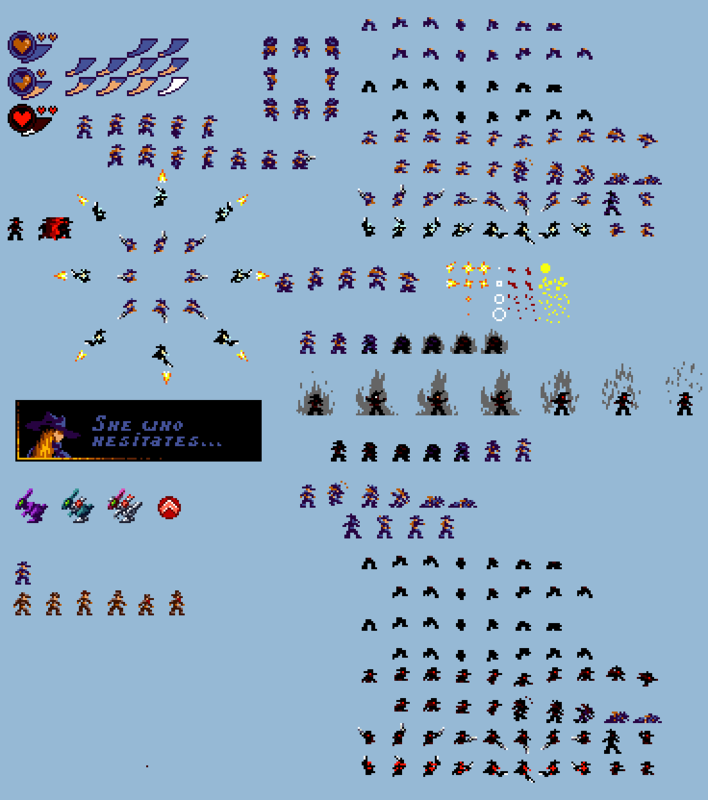 I’m going to steal the hell out of that sprite sheet, but I’m going to turn her into Zeta, which means my game can’t go into the Assemblee. Still, if you’re looking to make a game (or trying to come up with an idea for a game) definitely check that page out while it lasts. ~ by Anthony Salter on December 11, 2009.